You've got your portfolio ready, your website set up and all the equipment to start working. But how and where do you get new clients? In this blog article I will give you the 3 best ways to get your first photography client today. I have been a wedding and brand/product photographer for over 8 years. So while I have experience with clients already, stepping into a new direction for my photography business has meant looking for an entirely new market for my first photography client. In some ways it has been like starting over again. My current network of clients and photographers are in a completely different market to the one I am now targeting; with maybe the odd exception. I am now in the process of finding all new clients and building new networks. Fortunately I already have the experience in this area. You simply cannot build your portfolio and website and just expect clients to find you; or even come to you asking you to work for them for big piles of cash. It just doesn’t work like that. 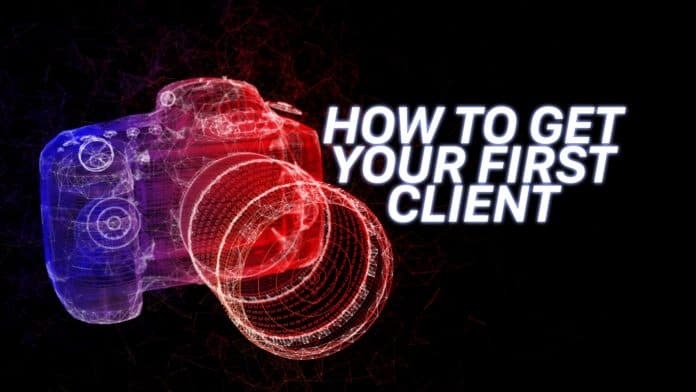 So these are my best suggested steps to getting your first photography client and get new clients that keep returning. This can be a very divisive topic. There are a lot of photographers firmly in the ‘never work for free’ camp and others who see the benefits of the opposite. I think the issue stems from the value return from clients and the risk of being taken advantage of. Let’s first talk about the benefits first. Let’s say you are absolutely brand new and you have a very minimal portfolio. And you want to work in product photography. You want to work with a coffee shop that has a great brand and reach. You could approach them, offer to take some photos and video as a one time offer. If they like the results and see value in your work, the next time they want to invest in their advertising/social media, given your proven record, they will seek you out. This time, as you mentioned before, you give them a quote and you’ve now established a business relationship. A lot of my first photography clients I have had were obtained through networking. There are an incredible number of benefits you can benefit from with an extensive network of fellow photographers. If another photographer gets a job and needs a second shooter and you are in their network, you’ve provided the opportunity for them to call you to see if you can help. This isn’t restricted to just fellow photographers. Clients you have on your books, may be able to recommend you to others if someone is seeking services like your own. So how do you network? Social media is possible the best source. Finding related groups where other photographers post about jobs is good place to start. Instagram is a great source for both clients and other photographers to find you. Having a portfolio relevant to the niche you are in is a great showcase for anyone wanting to hire you. Utilising hashtags and maximising your SEO is an important tool to get your content in front of the audiences you know will want to see your work. Normally you have a portfolio and CV and you will go on a jobs site and apply to all relevant jobs and hope for the best. But a great method is to actually target and approach the company you want to work for. Say you wanted to work with a local brand, let’s use the coffee shop again. You can go into the shop and buy some of their branded products and elsewhere get a good looking coffee cup. At home you set up your branded shoot with the branded product and coffee in the way you would shoot if you were being paid to do it. You take these photos to the coffee shop and say ‘Hi, I want to work with you and I made these photos to show what I can do with your brand’. This is a really powerful way to get yourself a client. The potential client will see that you have sought them out in particular and gone the extra mile to get the job. The problem with this, is with the number of jobs that new starters usually apply for, creating targeted content for each application would not be feasible. If they reject your pitch, while it’s good content for your portfolio, it’s time lost chasing a lead that didn’t convert. Be smart with which client you target. With big companies you might find it difficult to get your pitch seen even if you manage to get the contact for the person who hires new staff. You need to keep pitching. You will get lots of rejections to begin with. Letting this get to you and put you off is the worst thing you can do. Stay active. You need to be posting often and to a high quality to attract your first photography client and then new clients. The more work you are pushing on social media, the more eyes you are getting. And make sure to keep delivering the highest quality content you can. Clients will keep coming back if they see you also producing content that is leveling up each time.